Known by many different names – separators, filter separators, knockout pots, cyclone separators, centrifugal separators, vertical separators, SKUDs, horizontal separators, spherical separators, flash tanks, scrubbers, slug catchers, line drips, slug catcher, steam separator, sand separator – they are designed to do what their name suggests:separate whatever comes in. The main job of a separator is to separate hydrocarbon streams – oil, gas and water and sometimes solids – produced at the wellhead, into their constituent phases. The principles behind separators are simple. Momentum, gravity settling, and coalescing are used to aid in separating the phases. One, or more of these principles is used in an oilfield separator. Momentum change is used to separate liquids by causing an emulsion stream to suddenly change direction. The heavier part of the emulsion cannot change direction as quickly as the lighter part can, so separation occurs.Devices which affect such a change are typically called inlet diverters. They can be something as simple as a bent pipe, or just a box or plate welded to the internal projection of the inlet nozzle. Gravity can further help separate the streams. This is not always the case as oil of API gravity 11 and lower is heavier than water and will actually slip underneath fresh water in a vessel. This is often called phase inversion.If you’re wondering why process engineers are so interested in your water gravity, now you know why. 1.15 s.g. water can be a real lifesaver in such a situation. Design criteria for a separator differ between a low pressure oil well, (made up mainly of a large volume liquid phase) and a high pressure gas well, where the gas volume is high and the liquid is often a lighter weight hydrocarbon. Either one may contain free water as well.Other factors affecting separation include operating pressure, temperature and composition. An increase in pressure, or a increase in temperature will typically affect separation positively. Internal features such as baffles, inlets, weirs and mist removal sections set the better-designs apart. In order for a separator to effectively handle the liquids it, a correctly located set of internals are required. These may provide the floats with a quiet chamber that’s not constantly turbulent. The baffles also separate the phases from the incoming emulsion so that it cannot be constantly “upset” every time a slug of fluid/gas enters. Outside level control cages are another way to provide a quiet environment for level controls to function optimally. Cages are more often installed on sour vessels where additional isolation for instruments and controls is desirable. Off-the-shelf, low budget separators may be fitted with a float in the “wide open” vessel, but all that is protecting it is a small piece of steel located about two feet above. This approach may work in some instances, but if you need to meter clean water and oil, think about buying a brand-name separator that meets your unique requirements. Conversely, if you know accurate metering will happen at a gathering facility downstream, and all you need is a rough idea, it may make sense to keep things simple, and on budget. When purchasing a separator, the mist extractor is often overlooked. The mist extractor is made of stainless steel and woven wire. The mist extraction section is typically compressed to a known density, such as 9 pounds per cubic foot (for vertical flow operation, like in most vertical separators), or 12 pounds per cubic foot (for a horizontal gas flow direction). Mist extractors remove the entrained liquids from the gas stream. Correct placement of the mist extractor is crucial to its performance. Independent process engineers confirm that poor placement of the mist extractor in a separator causes significant issues for producers. When not done correctly, liquids get carried over into the gas line. It is not uncommon for us to look inside the outlet of a vertical separator during an overhaul which have a mistex section placed too close to the outlet. The mistex pad clearly shows that only a small portion of the diameter ever worked for a living. The outer diameter is still new looking because it never caught a drop of mist. Spending more time on design requirements for the separator at the beginning of the process will prevent downstream hassles of entrained liquids. There are good rules of thumb which guide vessel designers to have the mistex section a certain distance away from the outlet so that the entire mistex section can do its job. Orientation of mistex pads is also important. If you’re counting on mother nature throwing you the occasional curve ball, you’ll probably want your mist extractor mounted vertically in a horizontal vessel so that when a liquid slug hits your vessel, at least you won’t get liquid carried over into the gas leg. There are optimal ways to locate the mistex section. Ideally the liquids captured drain into the emulsion side of the separator, not the oil bucket for example. You will also need to consider the separator configuration – horizontal or vertical. Vertical separators are typically used when there’s more gas than liquid. If there are liquid slugs anticipated, but overall low liquid rates are likely, a simple increase in the height will keep you covered. Horizontal separators can handle larger volumes of liquids, and also will help release dissolved gas from the liquids. The larger interface area makes a difference in separation effectiveness. Some variations on these themes are “boots”. 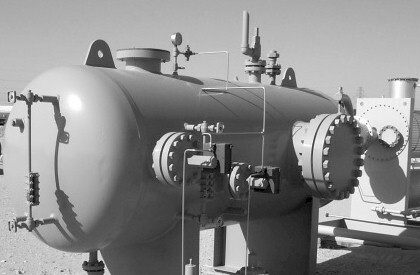 A vertical section added to a horizontal separator can add gas residence time when placed on top, or more water residence time when located at the bottom of the vessel. Picture a horizontal vessel that may occasionally have a gas or water slug. By adding a small vertical portion to the vessel you combine some of the advantages of each configuration and buy some residence time. One important consideration often overlooked is that large vessels, especially ones with liquid boots, can become unwieldy to manage in the shop, expensive to house completely, and very expensive to ship. While not as commonly used, spherical separators provide more economical alternatives for people with very high-pressure requirements. The sphere provides a maximum of protection with a minimum of steel and so at the best possible price. This is why people who have to use 5,000 psi separators trend towards spherical units. There are other designs, including the very small separators that can often be seen in shallow gas areas. Here, small amounts of liquids and gases need to be separated prior to measurement, but done economically. These units are sold for prices under $15,000 including catalytic heat, meters, PSV’s, fuel gas scrubbers etc., and all that in a 4’ x 5’ box hanging off a small diameter pipeline. They go by names like “suitcase separator”.